Melissa Bartow’s cinnamon, chocolate, and vanilla date spreads seem too sweet to be healthy. Fooled ya! When Melissa Bartow was in college, dates were on her mind: the chewy, gooey fruit with the super-sweet, caramel-like flavor. Hoping to create a healthier alternative to sugary syrups and fatty spreads, she blended up her first batch of date spread in her dorm. Now she makes cinnamon, chocolate, and vanilla versions, all nutritional powerhouses that satisfy even the biggest sweet tooth. 100% natural, low in calories, and packed with fiber, vitamins, and minerals, each is made with just five ingredients. 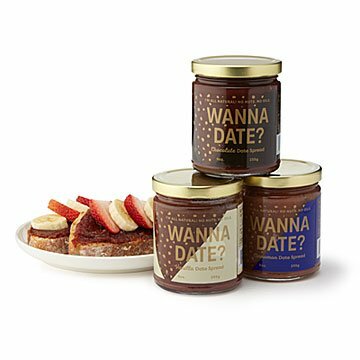 Sorry, cookie butter: you're about to get ghosted. Nut- and allergen-free. Handmade in Brooklyn. Melissa Bartow had her first date (the fruit kind) when she moved to New York for college, and it was love at first bite. She loved their sweetness, and better yet, they stopped her sugar cravings. Over time, she lost weight and became more energetic. During her junior year, she began working at a smoothie and acai bowl shop and was shocked to discover that there was added sugar and fat hidden in almost everything. “One day I wondered why we didn't just sweeten our products with dates. Dates are healthy, they taste really good. Maybe there was a way we could drizzle the dates on the bowls like a nut butter. It turned out that there wasn't.” Now, thanks to Melissa, there is. Fantastic taste could not be any better, Great price.